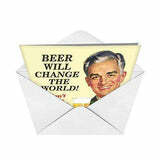 CARD'S INSIDE SENTIMENT READS: Happy Beerday - American author, storyteller, humorist, voice actor, and radio personality Garisson Keillor said, You get old and you realize there are no answers, just stories. 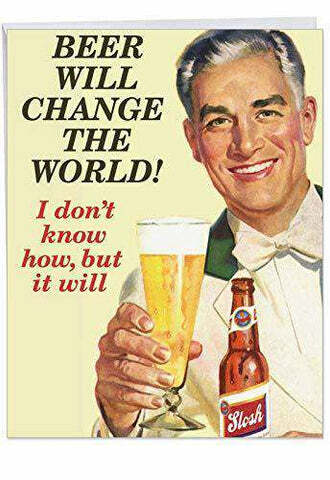 There will surely be better, more interesting stories when there's beer involved. Create funny memories on your friend's birthday. 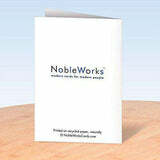 SIZE: This JUMBO 8.5 x 11 Inch notecard is the perfect way to greet a friend or loved one on his/her birthday. It can be described as Extra Large, compared to ordinary greeting cards. It makes a Big impact and it leaves a Big impression. To know how to grow old is master work of wisdom, and one of the most difficult chapters is the great art of living. Surely beer drinking, getting drunk and nursing a hangover require mastery. Cheers to your friendship! USE: Give this high quality stationery set as a gift on your friend's birthday. It ships pre-folded in a protective wrapper with a mailing envelope for your convenience. Close friends are truly life's treasures. Sometimes they know us better than we know ourselves. With gentle honesty, they are there to guide and support us, to share our laughter and our tears. Their presence reminds us that we are never really alone. Be the beer bearing kind of friend. 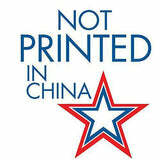 ABOUT THE CARD - Keeping US jobs at home, most of our products are Made in the USA (some printed in Canada) for more than 39 years, unlike our off-brand Chinese competitors! We print our greetings on snow white, thick, recycled cardstock, made from renewable farmed trees. Our print on demand technology is a modern (we no longer use papyrus, naturally) eco friendly, reduces waste and minimizes environmental impact.